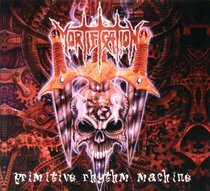 With Mortification well back into their Thrash roots and with the success of the Bloodworld release, Steve Rowe took a swing at a very rhythmic, almost tribal sytyle of Extreme Metal in Primitive Rhythm Machine. With long-time guitarist Mick Carlisle and young drummer Phil Gibson unable to continue with band commitments, Rowe went to LA to record Primitive Rhythm Machine. Featuring Canadian friends Jason Campbell on guitar and Bill Rice on drums, Primitive Rhythm Machine was recorded at the major Frontline Studios in Los Angeles with Metal producer/guitarist George Ochoa. Ochoa contributing majorly to the album's guitar playing. Following the recording of the drum and bass Guitar tracks Rowe, Campbell, and Rice set out on an extensive tour of the US, taking in clubs and halls across the country from wintry Colorado and Wyoming to the warmer regions of New Mexico and all the way across to Florida. Upon returning to LA the guitar and vocal tracks were recorded with Campbell and Ochoa sharing the rhythm trade. Ochoa laid most of the guitar lead breaks but also hired the service of local guitar shredder Dave Kellogg. Rowe has always been a huge fan of Ochoa's Power Metal outfit Recon, fronted by the incredible Vett Roberts on vocals. Rowe's late 80's band Lightforce - being a streetwise Power Metal act - had really looked to the other bands in the US Christian Metal scene. Roberts added some amazing operatic vocals to the song "Providence" followed by Rowe's deep growling Death Metal tones. Once again the "raw and real" sound approach was taken, well-suited to the album title. The title track "Primitive Rhythm Machine" is the band's most "tribal" sounding song. At the time, many were labelling Metal's rhythmic style as "evil", but Mortification shouted out loud that "God creates jungle beats"! Primitive Rhythm Machine's cover art was a hit with the fans and began a long relationship between the band and American artist Troy Dunmire, who has been responsible for most of Mortification's album cover artwork since.